Like most large river delta, the Mekong Delta is the most fertile and is agricultural land. This area is very rich for rice producer. 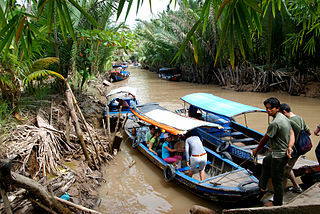 About life in the Mekong Delta is always associated with the river. In fact, traveling from one village to another is often times easier by boat than by road. My Tho is the capital of the province of Tien Giang. It was the first city to be visited by the tourists from Ho Chi Minh City. When you follow a day tour from the Mekong Delta, most likely you will be taken by bus to the May Tho, before continuing exploring the river by boat. This includes more mighty city compared to other cities around the Mekong River as proximity to Saigon. When not following the tour, you can go to May Tho with riding the bus. From Ho Chi Minh City, you can search for My Tho bus majors at Mien Tay terminal. In My Tho you can go to Ben Tre by ferry.From here you can also take a tour of the eprahu down the river. On the edge of the river you will find some people who offered the tour. Find the cheapest. Ben Tre is the capital of the province of Ben Tre. located only about 20 minutes by boat from My Tho. Although very close proximity to Saigon or My Tho, Ben Tre is still thick atmosphere with rustic aura. Tourists usually only get in My Tho and rarely get up in Ben Tre. This small town has a beautiful view. On the edge of the brown river, water palm tree grows, houses made of bamboo, and high weeds. Ben Tre can be reached by bus or boat. If you want to adventure with a boat, you can start from Rach Mieu in My Tho. But you will be down about 10 miles from the city center. The easiest option is to use Xe om from the edge of the river to downtown. From Ho Chi Minh City, you can also ride the minibuses from Mien Tay terminal and Cholong. In the past, people still have to connect the bus to the ferry for a trip to Ben Tre. However, after the construction of a bridge that connects between Saigon and My Tho, overland journey to arrive at the terminal directly to Ben Tre. If you want to stay in this small town, you should perform additional research more thoroughly. According to information, a lot of brokers who will offer travelers accommodation in the terminal. The town is actually similar to the most suitable countryside surrounded by bicycle or motorbike. You can go to the mill liquor made from rice, market, and cement plants. If you are not able to visit Cambodia, Soc Trang could be an alternative. It has a very high population of Khmer ethnic. In addition there are many temples here were built in the style of khmer. You can go to Soc Trang by bus from Mien Tay in Ho Chi Minh City. The journey from here about 5 hours. Some interesting attractions here like a bat temple is famous for its many fruit bats living in the back of the temple. The monks protect the bats, while farmers consider them as pests. Many also often catch bats for food. The most appropriate time to look at this beast is a few moments before sunset. You can use a Xe Om to reach this temple. Other attractions are the clay Pagoda. The pagoda is decorated with thousands of colorful statues. There used to be a monk who also has engraving stay in this temple. he spent 60 years to create and install the sculpture on the wall of the pagoda. Some forms of which can be seen are white baby elephant statues, pillars dragon, white tiger, and gold tortoise. Cheap accommodation in Soc Trang can be found at Que Huong Hotel and Khach San Khanh Hung. Soc Trang town is very small and irregular. Public transportation is very limited, so the easiest way to get around is by using a Xe Om. no definite rate, you can only make an offer to the Xe Om driver. ATMs are available in the front and in front of HotelKhanh Hung Que Huong. Phu Quoc is a tropical island in southern Cambodia, but became part of Vietnam. The island is beautiful because in addition to having white sand, hilly topography with dense forests. The population of the island is around 80000 people. Reportedly this island has the most beautiful beaches in Vietnam. Some even equate this with phuket island in Thailand, but with excessive development. In conclusion, Phu Quoc is amazing and you are very fortunate to have the opportunity to visit the Temples. Before going any further let’s look at a little history of the island of Phu Quoc. In the 18th century the island became a French missionary base of Pigneu de Behaine. The missionaries never even gave asylum to the Prince Nguyen Anh who became Emperor Gia Long when hunted by the rebels. During the Vietnam war had occurred battle on this island. however, in general, this island used by South Vietnamese army as a prison to hold the Vietcong forces. Phu Quoc is also the best fish oil producer worldwide. Phu Quoc island is actually part of the island, totaling 26. In addition to having green hills, rivers, and sandy beaches, Phu Quoc is also known for having beautiful coral reefs, especially in the south and west sides of the ocean. The population of the island is around 85000 lives, livelihoods related to the sea. Most of them are fishermen. This population is settled in two major cities, namely An Thoi and Duong Dong, as well as several fishing villages in the vicinity. In addition to fishing, is a growing business services related to tourism. In the center and south is largely tropical forests have been cleared for cropland and settlements. Meanwhile in the northern part of the dense tropical rain forest because it has been applied to the national conservation law. Phu Quoc Island has a tropical climate with three seasons, namely summer, rainy, and transition. Summer occurs between November to March when the average temperature during the day reached 31 degrees Celsius. In this season the sun usually shines with fog in the morning. Afternoon exploring fog is gone and replaced with sunshine. Humidity is very low at that time. Transition season occurs between April and June and the end of October, when the air temperature is even a little hotter than your body heat, but the humidity was also very high. While the rainy season occurs between July and September. Phu Quoc can be achieved through the Ho Chi Minh City in several ways. such use Aircraft, travelers can fly to Duong Dong Airport from Saigon with a choice of several airlines, such as Air Mekong and Vietnam Airlines. Do not be surprised if the aircraft used is a propeller plane. From Rach Gia also a Vietnam Airlines flight to this island. the ship is a cheaper option as ferries serving the route between Rach Gia and Phu Quoc, Ha Tien and Hon Chong. Distance traveled by ship around 2.5 hours. There are several transportation options when tourists are in Phu Quoc. Renting a motorbike is a common thing that travelers do when visiting countries in Southeast Asia. In Phu Quoc you can rent a motorbike with rates ranging from $ 5 to $ 12 per day without petrol. You can also surround the island with a Xe Om, but agree on the price per day and the first attraction to be visited. Most streets are not paved island with big hole, so always be alert. If you come with group, hire a jeep with a driver could be an option. You can hire a jeep for a day or half a day. Jeep and motorbikes can be hired from Tony Tour. Usually it easy for travelers to get a taxi at the airport. Similarly, in Long Beach, the largest beach in Phu Quoc. The taxi fare is slightly more expensive here than in Saigon and mostly use the meter. When staying in Long Beach, you can very easily get around by walking. But, of course, would not have been driving around the island only by foot.